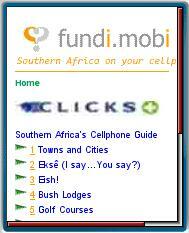 Fundi is a mobile web guide to businesses, events and attractions throughout South Africa. Listings, which include click to call numbers and in most cases a description and address, are organized by city or town as well as by topic area. South Africa is expecting a massive influx of visitors for the FIFA World Cup next year and guides like Fundi should be popular. This entry was posted in Travel and tagged mobile site review, South Africa, travel guide by Dennis Bournique. Bookmark the permalink.